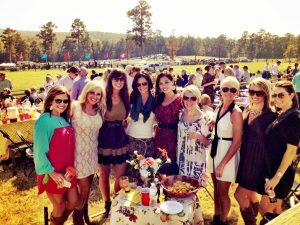 Ask anyone in Columbus to name one of the greatest, annual events, and most of them will excitedly blurt out, “Steeplechase!” Held at Callaway Gardens, Steeplechase is known as the area’s most prestigious, social gathering. Anyone who is anyone will be there, tailgating around the track, filling the beautiful terrace boxes, or gathered under their ornately decorated tents in their fanciest hats and better-than-Sunday-Best. While everyone might know Steeplechase is a big, fancy horse race, there is so much more to this extravagant event than meets the eye. Read this list of little known facts, so you’ll be an expert on race day. Steeplechase raises money for the arts in Columbus. Steeplechase is a nonprofit organization. Each year they use proceeds to support the arts in our community, and it makes a huge impact. In fact, since Steeplechase at Callaway Gardens began, they have donated over $3,300,000 to art organizations in the area! This year, The Columbus Museum, The Columbus Symphony Orchestra, the Historic Columbus Foundation, the Ida Cason Callaway Foundation, The Springer Opera House, and they added a sixth beneficiary, The RiverCenter, to be given funding from the event. Steeplechase at Callaway Gardens is actually several events. Maybe you’re thinking, “Gee, I didn’t realize horse racing was so popular in this area.” While the race is impressive, fast-paced and thrilling, this is not the only draw. Steeplechase not only consists of several different horse races, but also a bunch of fun activities for kids, delicious food, contests, and even a terrier dog race. The gates open at 10 am, and there is no shortage of entertainment. You can even climb a rock wall, though you might want to ask someone to hold your giant, flowered hat first. 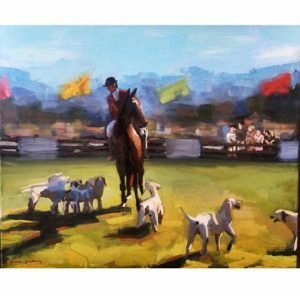 Each year, Steeplechase features a local artist. This year the featured artist is Katie Jacobson, selected by the race director. The featured artist’s work is displayed throughout the venue, and is also part of all printed and promotional materials. It’s a big deal. Katie is a very talented, hard working artist, deserving of the honor. You can check her out on Facebook here. The fine folks at Steeplechase recommend men wear sports coats and slacks, and women wear skirts or slacks, sweaters, and of course, hats. The greatest sights at Steeplechase should probably be the beautiful, sleek, thoroughbred horses running in perfect form, but the fashion just might steal the show. Every lovely lady is hoping to out-hat the other lovely ladies with her floppy, flowery, sparkling hat perched atop her head. Hats play such an important role in race day that Southern Views Magazine hosts a hat contest with registration starting at 10:30am at The Terrace! Categories include Most Whimsical, Most Glamorous, Creative Kids, and Best Overall. You might be wearing the latest designer fashions on the day of the races, but don’t forget the hat! Boots are very significant to Steeplechase as well. Pursona is holding the 2nd Annual “Show Us Your Shoes” Giveaway. Wear Pursona shoes, take pictures and possibly win one of 3 gift cards! Steeplechase is a family affair. Steeplechase is fun for the whole family, and no one knows this better than founder Mason Houghland Lampton. Mr. Lampton founded Steeplechase, which later moved to our area after his marriage to Mary Lu Hardaway, with his father in 1974. Since then, he has hosted the event. His son, Mason Hardaway Lampton, has been heavily involved in Steeplechase. Even more exciting is that Mason has competed successfully in many races. He even won an event at the Steeplechase at Callaway Gardens in 2000. His other son, Whit, competed in pony races last year. This year, sons Whit and Henry Lampton are returning to the race too! Steeplechase at Callaway Gardens is 30! 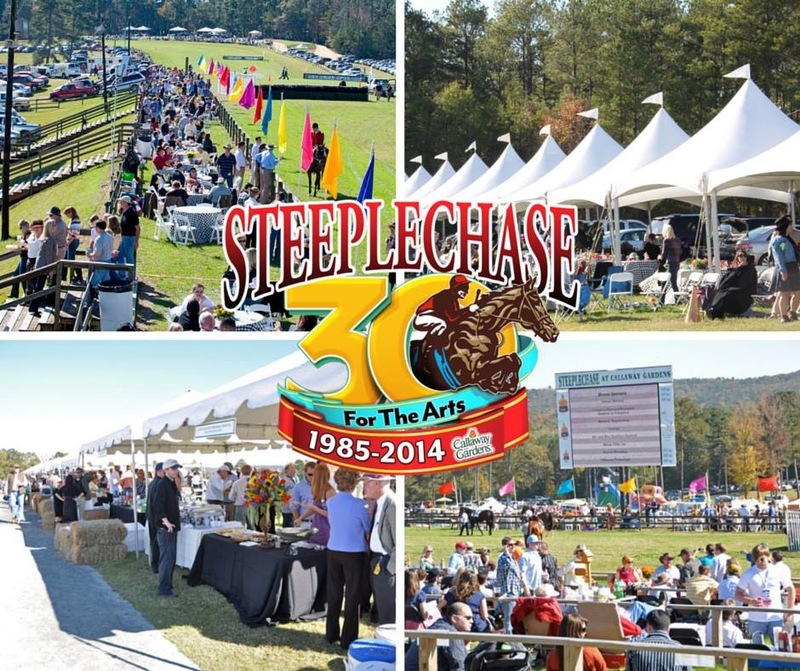 Founded in 1974, Steeplechase celebrates its 30th birthday this year, and she has never looked better! If you’re planning to tailgate, this is the perfect excuse to bring a cake to the festivities. 30 candles. Red velvet. Steeplechase at Callaway Gardens is not just the premier social event of the year, but it is a vital lifeline to the arts in our community. Steeplechase is so much more than a horse race. Now that you’re an expert, pack your picnic basket, drape a sweater across your shoulders, throw on a fabulous hat, and head to the races!